The North Oregon Coast is a pretty sweet Northwest destination. It’s got it all – wide-open beaches, beach towns worth visiting, good food and lots of adventures to be had. Where the Washington Coast tends to be quieter and offer few amenities, the northern stretch of the Oregon Coast from Tillamook up to Astoria has everything travelers could need…yet without being overbearing as a vacation spot. Restaurants, shops, grocery stores – check. Crowds, traffic, tourist traps – not so much (although, you will spot plenty of touristy activities). Below is an itinerary of our favorite spots on this stretch of coast as well as ideas for what to do at each one. If you’re coming from Washington, start at stop #1. If you’re coming from the south, you can easily reverse this itinerary and start from the last day working backward. Customize the itinerary by spending as much time as you’d like in each stop. Not as big on maritime history or the Goonies? Stop for lunch in Astoria and then move on. Need a good dose of the beach? 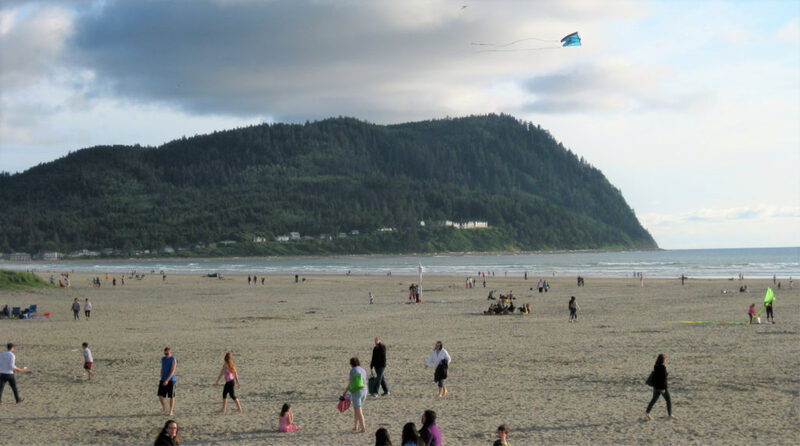 Stay in Seaside or Cannon Beach for a few days! You can board a boat and explore just behind the Columbia River Maritime Museum. If you’re coming down from Washington State, drive across the Megler Bridge for some added coolness on your approach into this quaint Victorian town. If you’re coming down I-5, that won’t be an option so you’ll need to make the call between taking the slower “scenic” route along Highway 101 that leads to the bridge, or just taking I-5 down to Highway 30 to get there quicker. We have done both and I probably would stick to the quicker route if your kids are young. Start your time in Astoria by climbing the Astoria Column for stellar views and working off some energy as you climb the 125-foot tower. Get the lay of the land and see it all from up high before you delve in. Chances are someone in your family likes or loves the Goonies. If so, put checking out some Goonies sights high on your list. Be warned that the actual Goonies house is indeed here, but it’s a private residence and the owners don’t appreciate people driving by and gawking at or photographing their house. I’d recommend skipping it. Instead, visit other spots that made appearances in the movie from the Oregon Film Museum to the Flavel House. Explore downtown Astoria either on foot or by hopping on the trolley or by riding a bike along the Riverwalk. Visit a museum or two if you have the time. The largest of these is the Columbia River Maritime Museum right in the heart of town where there are plenty of hands-on activities and even a boat you can board out back. Look for sealions on the docks around town. This can easily be added into any of the adventures you have, but grunting, barking sealions are likely to be a highlight for the kids. Great road trip stop: Fort Stevens State Park is right outside of town and makes a great stop if you’re heading south. The park has plenty of hiking trails and open spaces, but also has a real live shipwreck in ruins on its shore. For more ideas on what to do in Astoria, read our full round-up of things to do in Astoria. Seaside is family-friendly and fun beach town. Seaside is the kind of place where you could spend a single night or a week. There’s plenty to do for longer stays and even if you run out of things to do, you can always enjoy the wide-open seashore. Seaside is located off of Highway 101 and you’ll pass right through it so it’s tough to miss. First and foremost, spend some time on the beach. Seaside’s beach is wide-open and goes forever. You could walk for miles on the sand before you run into anything to stop you. Got small kids who don’t love walking? Set up camp and build some sandcastles, touch the water (it’s really cold so it’s not the kind of beach you’ll want to swim at), and there are even some swing sets on the sand here and there. Many nights, people build bonfires on the beach and make s’mores and hang out. Seaside’s 1.5-mile promenade is called The Prom and its appeal is vast. For one, it’s paved so it’s perfect for tiny feet that might get tired walking on the sand and it’s perfect for strollers too. Enjoy views of the ocean and easy access to most of the hotels as well as Broadway Street, where all the good stuff is. Speaking of Broadway Street, spend some time exploring this stretch that runs perpendicular to The Prom. It’s got enough going on that you’ll find everything you need here, but it’s nice and compact so your kids don’t have to walk too far. You’ll find sweet shops filled to the brim with salt water taffy and other treats, an old-fashioned carousel, a couple carnival rides, shops that sell kites and souvenirs and snacks, as well as plenty of restaurants. If you have smaller children, then the Seaside Aquarium might be a good stop. Older children might not be as impressed as it is not a large aquarium, but it is one of the oldest aquariums on the West Coast! Feed the seals and peer into tanks to learn about local sea critters. Seaside is all about fun. On nicer days, something unique and lots of fun to do is rent a paddle boat from Wheel Fun Rentals, located just off the intersection of Broadway and Holladay (walk up Broadway until you come to a bridge over a river – the paddle boats are on the river below). While most people don’t really play in the ocean in Seaside (because it’s cold! ), renting a paddle boat is a way to do something watery while you’re here. Where to eat: Really, you can’t go wrong. Stroll Broadway Street and look for a cuisine your entire family can agree on. Safe bets always include breakfast all day at Pig ‘N Pancake, pizza at Fultano’s, or seafood at Doogers. Road trip stop: The Oregon Marketplace right on the edge of town between Seaside and Cannon Beach is worth a stop – more for you than the kids. Tell them not to break anything while you pick out a bottle of wine and some local art or chocolate. For more ideas on what to do in Seaside, read our full round-up of things to do in Seaside. The view from Ecola State Park looking toward Cannon Beach and Haystack Rock. Cannon Beach has always felt like Seaside’s more mature, older sister to me. Seaside is fun and colorful and a little zany. Cannon Beach is more sedate and a little more upscale. And yet, Cannon Beach also has lots of appeal for kids and families. Save some time as you’re driving into Cannon Beach to make a stop at Ecola State Park. This woodsy park is ideal for hiking, but if you’re not in the mood to hike, don’t skip it! It costs $5 to enter and it’s worth it just for the views. Drive to the viewpoint at the top of the park and look out over Cannon Beach far, far below as well as Tillamook Lighthouse. Haystack Rock is one of Cannon Beach’s top draws for a reason. It’s huge. It’s craggy. It’s got all kinds of critters flying around it and living in tidepools at its base that are sure to fascinate the kiddos. Bring some binoculars and look for puffins swooping around it. Or visit during low tide and peep into the tidepools. Just don’t go on Haystack Rock or any of the smaller rocks (called The Needles) as that’s a big no-no. Much like Seaside, the beach at Cannon Beach is wide open and perfect for strolling, playing in the sand, or simply camping out and enjoying the views. Flying kites or renting a FUNcycle are other ways to have fun on the sand. There’s something about going to a beach town that pairs well with sugar. You’ll find sweet shops in Cannon Beach selling salt water taffy and the usual array of candy, but you’ll also find treats that arguably shouldn’t exist…chocolate-dipped Twinkies covered in M&Ms, for instance. Also like most beach towns, exploring the shops is always good to do. Cannon Beach has plenty of art galleries that the kids may or may not enjoy, but be sure to stop by Gepetto’s Toy Shop or Voyager, if you have a comic book fan. Plenty of shops also sell kites, sand toys, seashells and souvenirs, too. Road Trip Stops: The drive between Cannon Beach and Tillamook has a number of stops worth making. 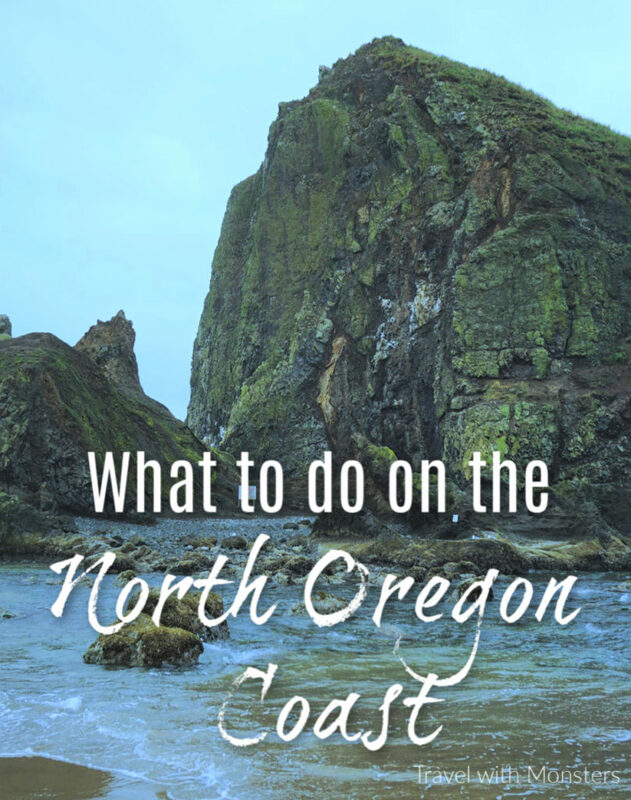 If you really want to go all out on this itinerary, plan in advance and take some time to ride the Oregon Coast Scenic Railroad or ride with the Oregon Coast Railriders. Both require planning your arrival time as both run at specific times and not all year round. For more ideas on what to do, here’s our full round-up of things to do in Cannon Beach. 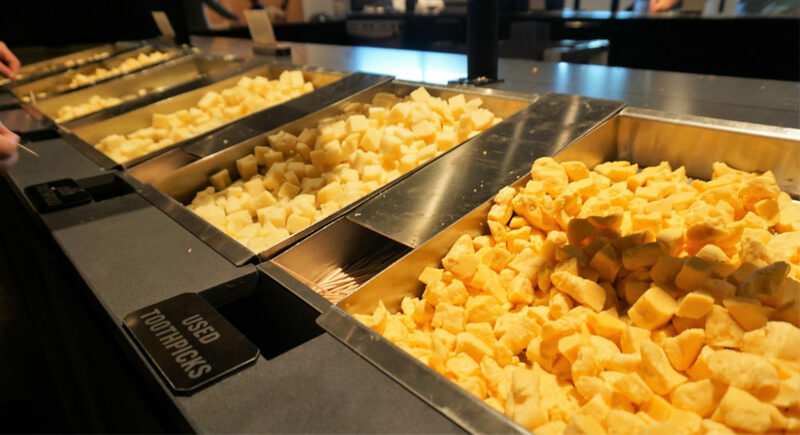 A bank of cheese samples is located on the second floor of the Tillamook Cheese Factory and it’s worth a stop. Really, there’s only one reason you go to Tillamook, and that’s because you want to eat or buy as many dairy products as possible all in one place. And it’s a noble goal to have. Tillamook Cheese Factory is about an hour from Cannon Beach and Seaside if you drive straight through and don’t stop to explore little towns like Rockaway Beach or check out any of the roadside attractions along the way. The drive itself is pleasantly scenic with a few giant rocks sticking out of the water, a tunnel that goes under a mountain where you can beep, beep, beep your horn through the darkness, and plenty of places to stop and explore. Time your arrival at Tillamook with some sort of meal time. If you don’t show up hungry, then there’s no point and you’re Tillamooking wrong! If you do this right and show up with an appetite, then your first stop should be the food hall where you can indulge in ice cream, pizza, or other dairy-laden deliciousness. Your next stop is to take the self-guided tour to learn more about how Tillamook does what it does, and also to taste the cheese samples located upstairs. After you’re armed with the knowledge of which cheese most floats your boat, your final stop is the store downstairs. Load up on Tillamook products or souvenirs. Even though I have this as the last stop due to its location, more than once, we have driven down to Tillamook on our first night in Seaside, purchased all the cheese our hearts could desire, and then started our vacation in the way God intended – with a cooler filled with smoked black pepper white cheddar. For more about Tillamook and all the dairy delights within, check out our full piece about Tillamook Cheese Factory.